Imagine a robot moving around in neighborhoods to protect residents from safety risks in the dead of night. 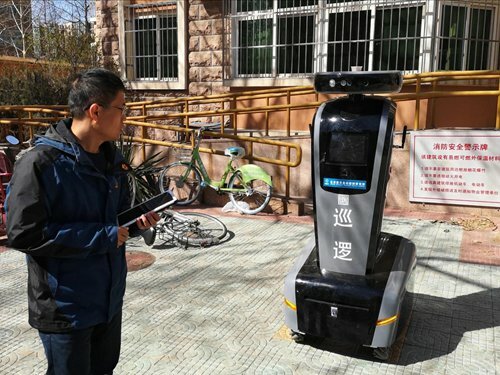 The Meiyuan residential community in Beijing has adopted a robot that integrates facial recognition, man-machine communication and infrared thermal imagery for the first time to help protect the neighborhood. Beijing Aerospace Automatic Control Institute (BAACI) developed the high-tech robot, named Meibao, to replace the human night patrol, with the support of the China Academy of Launch Vehicle Technology, an institute in China's space industry, Liu Gangjun, the project director at BAACI, told the Global Times on Thursday. Liu said the robot is being tested from December 2018 to April 2019. Meibao stands 1.7 meters, with cameras as eyes and a big screen showing images on its chest, the Global Times reporter spotted Thursday. 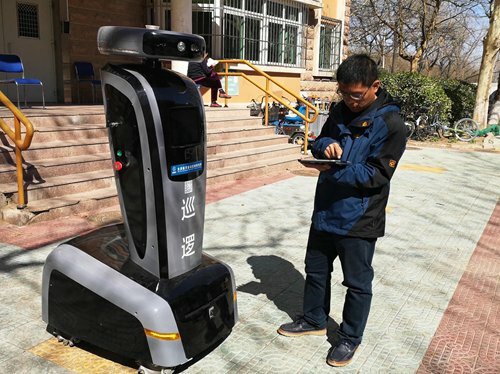 The technology is a combination of biological recognition, big data analysis, inertial navigation system and other technologies, which can accurately process the information of pedestrians, according to information provided by BAACI. Liu said the institute monitors and records neighborhood conditions. If any suspects show up in the community, Meibao or similar high-tech door locks would recognize them and the alarm in the department would sound off, Liu said. "I would be truly at peace with Meibao's presence," said a resident who seems surprised to have such an intelligent watchman. Meibao not only monitors illegal activities but also provides useful information to residents. For example, it can provide weather forecasts and interesting stories, and even play music, which often attracts many children to talk with it, said Liu. The institute has launched a project called "intelligent home" involving the robot, facial recognition door locks, digital annunciator board and smart watches designed to record senior citizens' health condition, Liu added. "I feel good that Meibao takes a part of the load off me," a watchman in the community told the Global Times on Thursday. He also noted that human watchmen's security work was heavy, having to take turns patrolling the community the whole day. In recent years, some districts in Beijing have adopted smart digital safeguards and convenient services for residents.